It’s wise to stand their water troughs off the ground, to deter other visitors to the paddock, like foxes and badgers, from drinking their water. Alpacas often chase these intruders away, but it’s best not to risk other animals sharing their water or food in the first place. Despite being hardy, alpacas do need some shelter from the worst weather at both ends of the scale, in extreme heat or cold. In really wet winters you might need to bring them into a shelter – a shed will do, or even some dense overhanging trees. You can enclose their field with stock fencing and two strands of plain wire along the top, but barbed wire is a no-no because they can gash themselves, something that can have potentially tragic consequences since they have large blood vessels running down the sides of the neck. Electric fencing isn’t a good idea either, simply because it probably won’t work. 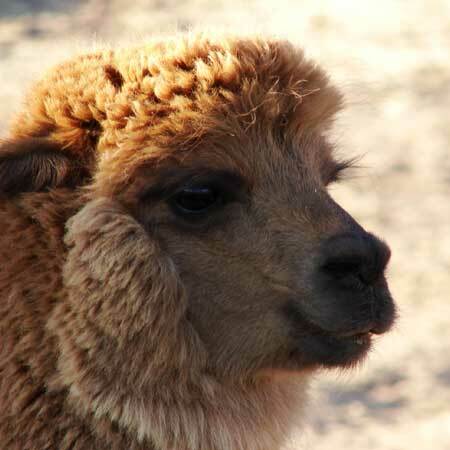 The animals’ super-thick fleece means they’re too well insulated to get a shock. DEFRA recommends you only raise six alpacas per acre, but you can keep more as long as you provide adequate food and water, and make sure their paddock is spotlessly clean at all times. Every year they need to be sheared by specialist shearers and you also need to keep an eye on their feet for overgrown toenails. Any questions about keeping alpacas? We’re always delighted to answer questions, so feel free to get in touch about anything and everything to do with our favourite animals.